One of the more annoying aspects of football is the length of time that passes between games. Not because of the fact we'd like to see more games. We all know that'd be physically debilitating to the players. What's irritating is the abundance of story lines that get concocted to satisfy the demands of fans who want to follow football games. Right. This includes Cowboys' soap operas. Then there's the New England Patriots, who are taking the AFC championship game point spread literally. 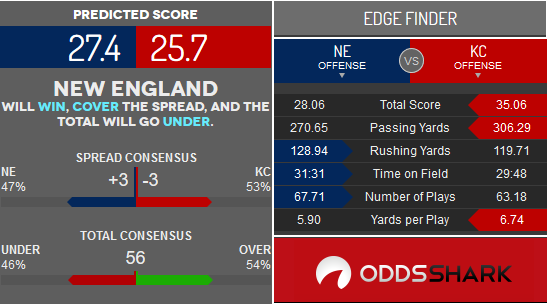 Does anybody really believe the Pats are underdogs in title games other than slender sportsbook math? Bovada has set the line at Kansas City -3 with the total being 56 and the moneyline at New England -130 and Kansas City +150. Besides the fact they're in this game year after year? A 3-point spread for the home team is basically their home field discount, so it's often considered to be the sportsbooks' subtle hint that they like the road warriors. A clear rebuttal to any argument against the Patriots is their championship pedigree and the fact that Tom Brady and Bill Belichick are the best QB/head coach combo in the history of the NFL. They’ve gone 8-4 SU in AFC championship games, and during the Belichick era, they’re an impressive 5-3 SU as an underdog in the playoffs. Emperor Palpatine has also had the upper hand against Chiefs coach Andy Reid, winning 6 of 8 head-to-head matchups. As for Brady, dude’s coming off a 343-yard passing performance, which was good enough for his second-highest mark of the season, and the Patriots have won seven of the last 10 games in this matchup. Yes, Patrick Mahomes II has been incredible and his receiving corps have gotta have superglue on their gloves, but the Chiefs' defense was the star of the show in last week's 31-13 throttling of the previously red-hot Colts. The Chiefs have the third-best home defense this season, allowing just 17.4 points per game. They allowed just one offensive touchdown last week, which Indianapolis didn’t score until the fourth quarter. The Colts were held to just 263 total yards of offense and were completely shut out on third downs, going a pitiful 0-for-9. Kansas City ranked in the NFL's top four in both points scored and points allowed at home. They had a +14.8 point margin at home, which ranks second. Arrowhead's gonna be freezing, with the high temperature expected to be 16º with strong winds. Since 2000, there have been 61 games where the temperature was below 20º. Out of those 61, a mere eleven finished with more than 56-points combined. Reid and Belichick are too experienced to let this game devolve into a shootout. What's more, Chiefs home games have seen an average combined score of 49.67 this season, while Patriots road games are at 45.63. Upon further review, maybe the Patriots are underdogs. They'e actually lost three straight road playoff games, which highlights the importance of getting the top seed in the conference finals. Toss in the fact that the favorite in AFC title games is 10-2 SU in the last 12, and let New England be underdogs.